This coming Tuesday, October 15th, Black Milk will release No Poison No Paradise, his first full-length solo album since the 2010 release of Album Of The Year. Earlier this week, the heralded rapper/producer released the self-directed video for “Sunday’s Best/Monday’s Worst,” and the song, full of story-telling lyricism and signature Black Milk soul chops is a strong example of what fans can expect from the new project. Today, following a strong performance at New York City’s legendary Santos Party House venue this week – the show was part of VICE’s ongoing Noisey Rap Party series – Black Milk has partnered with Pitchfork Advance to give fans a chance to stream No Poison No Paradise in full. 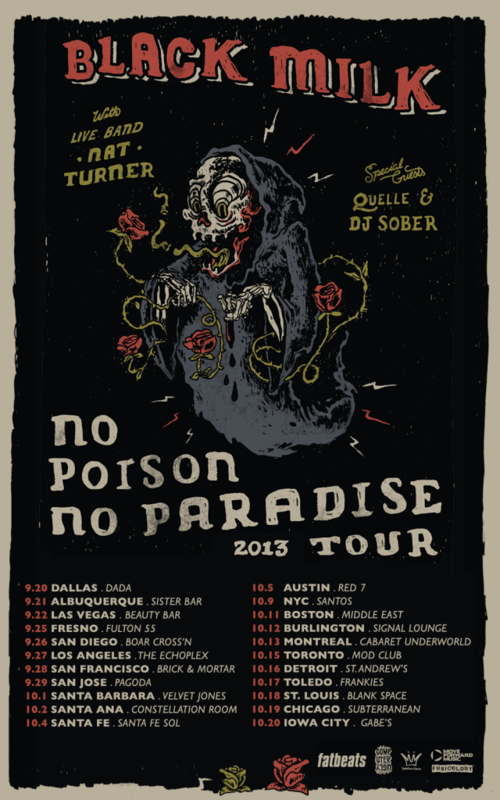 Black Milk’s No Poison No Paradise Tour with Quelle and DJ Sober is currently underway. Check below for remaining tour dates. Black Milk is a producer and rapper born and raised in Detroit, Michigan. As one of the most-celebrated auteurs of his generation of hip hop artists, he has conditioned fans and critics to always expect the unexpected each time he releases new music. Few producers have earned the notoriety and respect he has as a musician, and when that is coupled with commanding talent as an emcee, it’s no surprise that his solo releases are met with exalted anticipation. He has been making music professionally since 2004 and has collaborated with many noted artists including Slum Village, J Dilla, Elzhi, Phat Kat, Frank-N-Dank, Lloyd Banks, Canibus and Pharoahe Monch and Jack White of The White Stripes. In 2010 he released Album of the Year, which perfectly captured his soulful, jazzy style. He is currently putting the finishing touches on his new album, No Poison No Paradise, which is due out October 15th of this year.